Happy new year! 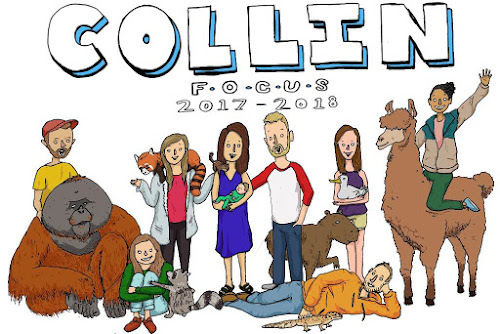 As always, I am excited to share our student update for the month. It's particularly exciting because it is someone from our campus at Collin College. Graham a good guy with a great heart and I'm excited to continue to work with him. Thank you so much to everyone who contributed and prayed for this campaign. Through y'alls support, and many other, God provided extravagantly and we went past the 50,000 goal. The official numbers are not in yet, but when they are I will be sure to let you know! Again, thank you so much for your generosity and compassion for our students, and for us. My favorite event of the year is upon us. As many of you know, the first winter camp I attended with FOCUS was January 2013. I was in a weird place, mentally and had been for a long time. I didn't expect to encounter something so big when I went, but I can tell you that event was a catalyst for me turning towards God, for real for the first time. The speaker that year was Geoff Mumley, a friend of ours Bellingham, WA. The most personally impactful thing I remember was him talking about changing the world, which at the time was a concept I had become jaded towards. He said something along the lines of "If we want to change the world, we have to change the story we are buying into and following". Again, not verbatim but you get the point. Anyway, he is back to speak this year and I am PUMPED. Please be praying that our staff, students, literally anyone who is around would be open to encountering Jesus authentically, not in a surface level way. Oh, please be praying for safe travel. We have probably around 600 people traveling a ways away from North Texas to East Texas. 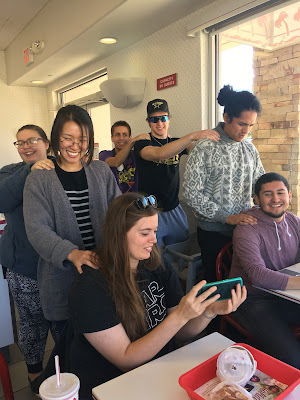 Spontaneous massage train at In N Out with our Preston Ridge students. I was uncomfortable, but we all had a good laugh about it. Our Collin Staff after our student Christmas party. 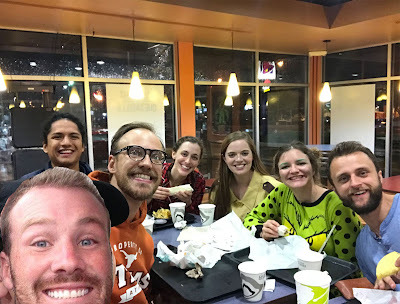 Garrett was photoshopped in.